A new steak house with a stylish twist has just opened in Cahatan’s Mihama area. Steak House Cowdy grand opening was on Mar. 3, and it is attracting customers with its New York-inspired atmosphere and sizzling grilled steaks. The steaks are famous trade-marked Ishigaki variety, which is renowned for its tenderness and sweet taste. The steaks are accompanied with Cowdy’s own sauce. The house special is a $10 steak that is served both at lunch and dinner including rice, salad and iced tea. Sushi, crispy pizza and smoked chicken are also available. Prices are very reasonable. For example portion of smoked chicken costs Y504, and smoked salmon Y588. There’s also a hamburger steak meal for kids costing Y714. Cowdy also has a large bar that serves a full selection of mixed drinks, cocktails and beer. Awamori-based cocktails are also available. Cocktails cost Y525 each while Orion draft beer is Y368 and Kirin Y473. 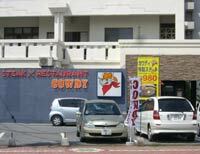 Cowdy is located on Highway 58 in Mihama area. Turn towards the Ferris wheel building from Hwy 58, and Cowdy is in the first building immediately on the right. Free parking is available outside the restaurant.